This is the first (in our lab) board based on the VIA K8T800 chipset and designed for the Socket 940. 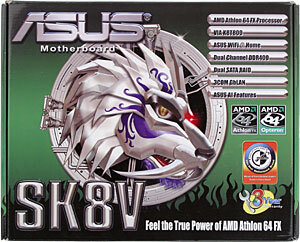 Its functionality is reinforced with additional controllers, and its poor overclocking (compared to nForce3) will hardly upset owners of the Athlon 64 FX or Opteron. 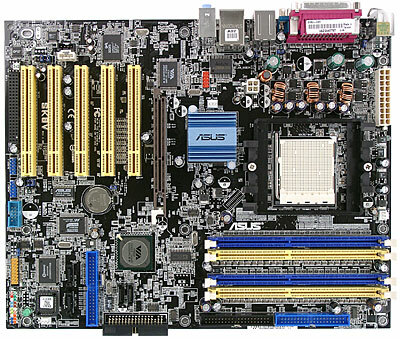 The board has the layout similar to the K8V Deluxe, but the DIMM memory slots are positioned differently (as they are more in number), and another processor socket is used. The layout is satisfactory, though the audio-ins are unfortunately positioned in front of the PCI slots and the IDE RAID connector is behind them. It can be difficult to reach some jumpers when the board is already installed. Their functions are not indicated on the PCB. +5 V StandBy is indicated with the green LED. The 3-phase switching voltage regulator incorporates 6 capacitors of 1500 uF and 3 of 1200 uF. There are also voltage regulators of the AGP bus (2 1000 uF and several less capacious ones) and of the memory (2 of 1000 uF). Unsoldered connectors: switches for setting CPU clock, IrDA and SMBus connectors, LAN PHY controller chip (probably ASUS is planning on releasing a less functional model on the same PCB). 3 connectors for fans (2 with rotation control). 3 audio ports (Mic-In, Line-In, Front). network controller based on the 3COM Marvell 940-MV00, 10/100/1000 (Gigabit Ethernet) supported. FireWire based on VIA VT6307 chip, 2 ports supported. General performance: Very good (see details). This is the best frequency response we've ever seen though the noise level is not record-breaking. ASUS WiFi@Home (connector (and WiFi-b card for Wireless Edition boards) for connecting to a wireless network of the respective standard). We used the BIOS 1001 as the latest available version. The BIOS features listed above are available in this firmware version, nonstandard functions weren't tested. Actually we tested few boards with the Socket 940, and taking into account that a chipset used doesn't make a great effect on performance of a given model we also took boards designed for other chipsets for comparison. If the memory timings are the same for all boards compared the performance is very similar, that is why all the boards which allow changing their memory parameters can be considered equal in speed.